Creeping, rosette-based, mat-forming perennial, often in dense colonies that exclude all other vegetation. Each flower stalk carries one large yellow composite flower head. The leaves have long hairs on the upper surface, and are downy white with star-shaped hairs on the undersides. Flowers Lemon-yellow, about 3 cm in diameter, solitary on leafless stalks. The florets often have a red stripe the on outer surface. Flowers Oct-Feb.
Fruit Purplish-black achenes, about 2 mm by 0.5 mm, with off-white, simple brittle pappus hairs 5-6 mm long in a single row. Leaves Dense rosette leaves are 5-8 cm long, almost entire, bluish-green. Leaves with scattered long hairs about 5 mm long on the upper surface, white with dense star-shaped hairs on undersides. Stems Slender, unbranched flower stalks 10-25 cm tall and slender, creeping, hairy stolons spreading along the ground surface. High-country tussock and dry pasture land, river flats and terraces, road-sides and forest margins. Increasing in NI in Rotorua, Volcanic Plateau, Lake Waikaremoana, Kaimanawa and Ruahine Ranges and in Hawkes Bay. Common throughout SI and, except for Nelson, abundant in upper Waitaki Valley. Originally from Europe, north and central Asia. A major weed of SI High Country pastures. Can be controlled by pasture improvement. Separated from other, similar species, by its large, solitary, pale yellow flowers and dense star-shaped hairs on stolons and undersides of leaves. Subject to Pest Plant Management Strategies in one or more regions. Check with the regional council for details. Hieracium from the Gr. 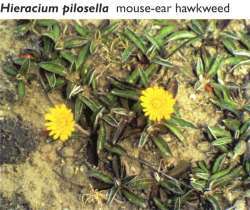 name for hawk, since Pliny, the Roman naturalist believed hawks ate the plant to strengthen their eyesight; pilosella (Lat.) = with short soft hairs.